Church historian R. Tudor Jones writes that “the majority of the martyrs were ordinary people, including many women”…John Foxe was an eyewitness and earnest historian of the fierce persecution in England in his day. 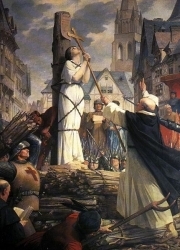 His Book of Martyrs gives detailed accounts of many public trials and executions of those whom the Roman Catholic Church judged to be “heretics” worthy of death. His descriptions of Christians being burned at the stake tell of their inspiring bravery in the face of such a horrible death and of the determination of Roman Catholicism to exterminate everywhere true Christians who opposed her. Similar records have come down of the massacres of Jews at the hands of the Roman Church. Through relentless torture, starvation, genocide, massacres, burning at the stake, against every conceivable fury of [Papal] Rome, they [i.e., the ‘seeds of protest’] could not be extinguished. History estimates that over one hundred million people lost their lives during that time of [Papal] Roman tyranny. Is it any wonder that God graphically describes this onslaught of [Papal] Rome as her being ‘drunken with the blood of the saints, and with the blood of the martyrs of Jesus’, and calls her the ‘Beast’? What has turned my soul against Roman abuse of power is the way in which it has tortured and burned such saints of God as Joan of Arc, hundreds of the Albigensian martyrs in France in the 12th century, the Knights Templar, John Huss [Czech Jan Hus], the Dominican Savonarola, the Dominican Giordano Bruno, [and] the Anglican bishops Cranmer, Ridley, and Latimer. The Inquisition has promoted at least two wholesale massacres: [hundreds of] thousands of Protestant Waldensians in northern Italy, and thousands of Protestant Huguenots by the massacre of St. Bartholomew in France. More than 30,000 of the most cultured Protestants of France were put to the sword on the night of St. Bartholomew, August 24, 1572. At the news [of this brutal, bloody massacre], the Pope had cannons fired, proclaimed a jubilee, ordered a Te Deum of thanksgiving to be sung, and struck a special medal to commemorate the glorious ‘victory’. To wring out confessions from these poor creatures, the Roman Catholic Church devised ingenious tortures so excruciating and barbarous that one is sickened by their recital. Of eighty popes in a line from the thirteenth century on, not one of them disapproved of the theology and apparatus of Inquisition. On the contrary, one after another added his own cruel touches to the workings of this deadly machine. Pontifex Maximus [i.e., the pope of Rome] has laundered the Inquisition’s name twice. In 1908, Pope Pius X renamed it ‘the Holy Office’, which [Pope] Paul VI transformed into [the] ‘Congregation for the Doctrine of the Faith’ in 1965.